During the Vietnam War, the U.S. Air Force sprayed more than 20 million gallons of Agent Orange and other herbicides over parts of southern Vietnam and along the borders of neighboring Laos and Cambodia. The herbicides were contaminated with dioxin, a deadly compound that remains toxic for decades and causes birth defects, cancer and other illnesses. To this day, dioxin continues to poison the land and the people. The U.S. has never accepted responsibility for these victims, and it’s unclear when this chain of misery will end. U.S. war veteran Larry Vetter conducts physical therapy exercises with 18-year-old La Thanh Nghia, near Da Nang, Vietnam. 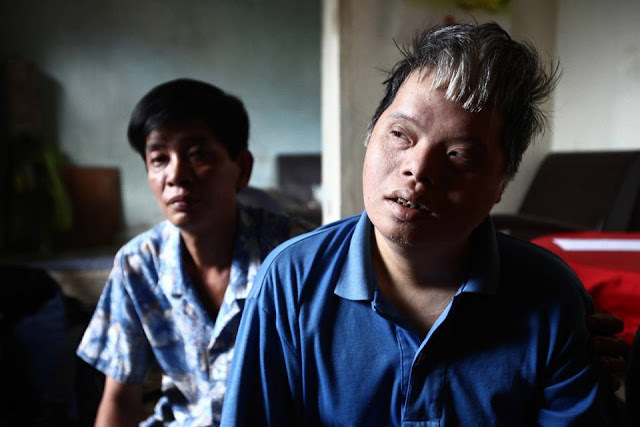 Nghia and his brother Toan, 21, are third generation Agent Orange victims, the result of the U.S. military's use of Agent Orange and other herbicides during the Vietnam War more than 40 years ago. The brothers were born healthy, but began to suffer from muscular dystrophy and other problems as they grew older. They are now confined at home as their bodies and lives waste away. The United States is paying to clean up dioxin around former American bases, but has yet to offer significant aid for victims. Jan. 5, 2013. Nguyen Thi Ly, 11, skips rope in her village south of Da Nang, Vietnam. Her grandfather served in the North Vietnamese Army during the Vietnam War, and she is a third generation victim of dioxin exposure, the result of Agent Orange and other herbicides sprayed by the U.S. military during the conflict more than 40 years ago. 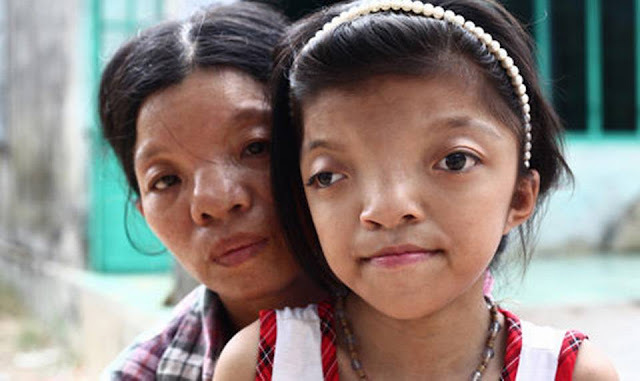 Like her mother, she suffers from severe facial deformities and chronic bone pain, but is otherwise a normal little girl with hopes and dreams for the future. Skipping rope is her favorite activity. The Vietnam Red Cross estimates that 3 million Vietnamese suffer from illnesses related to dioxin exposure, including at least 150,000 people born with severe birth defects since the end of the war. The U.S. government is paying to clean up dioxin-contaminated soil at the Da Nang airport, which served as a major U.S. base during the conflict. But the U.S. government still denies that dioxin is to blame for widespread health problems in Vietnam and has never provided any money specifically to help the country's Agent Orange victims. May 28, 2012. 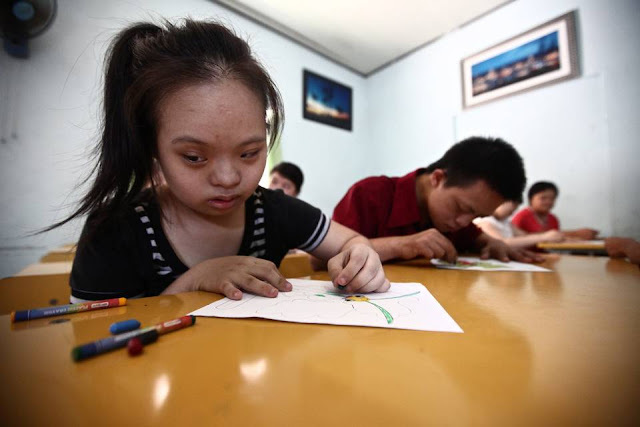 A girl colors a page at a center for children affected by dioxin exposure in Da Nang, Vietnam. The Da Nang Association for Victims of Agent Orange/Dioxin says that 5,000 people - including more than 1,400 children - around the city suffer from mental and physical disabilities from dioxin exposure, a legacy the U.S. military's use of Agent Orange during the Vietnam War more than 40 years ago. The United States is paying to clean up dioxin around former American bases, but has yet to offer significant aid for victims. May 28, 2012. A girl who cannot hear or speak poses for a photograph at a center for children who have been affected by dioxin exposure in the village of Hoa Nhon, near Da Nang, Vietnam. The Da Nang Association of Victims of Agent Orange/Dioxin says that more than 1,400 children around the city suffer from mental and physical disabilities because of dioxin exposure, a legacy of the U.S. military's use of Agent Orange and other herbicides during the Vietnam War more than 40 years ago. 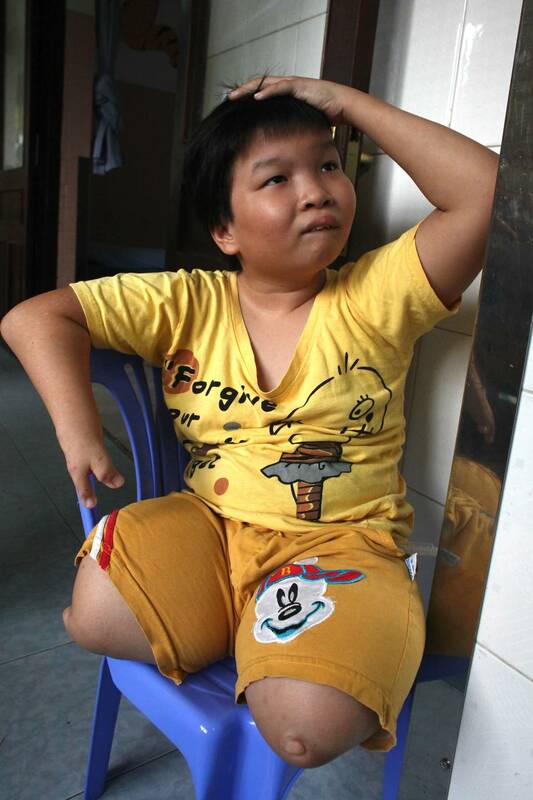 About 60 children attend the Hoa Nhon center each day. Many of them have mental disabilities or they cannot hear or speak. Children are taught to read and write, sew clothes, make handicrafts and help their families raise crops and livestock. The Vietnam Red Cross estimates that 3 million Vietnamese suffer from illnesses related to dioxin exposure, including at least 150,000 people born with severe birth defects since the end of the war. The U.S. government is paying to clean up dioxin-contaminated soil at the Da Nang airport, which served as a major U.S. base during the conflict. But the U.S. government still denies that dioxin is to blame for widespread health problems in Vietnam and has never provided any money specifically to help the country's Agent Orange victims. May 29, 2012. Tran Duc Nghia, 39, watches from a wheelchair as his mother talks about his condition at the family's home in Da Nang, Vietnam. Nghia and his sister are second generation Agent Orange victims, the result of the U.S. military use of the herbicide during the Vietnam War more than 40 years ago. The United States is paying to clean up dioxin around former American bases in Vietnam, but has yet to offer significant aid for victims. The family gets no government support, and 75-year-old Hoang Thi Te worries who will take care of her children when she is gone. She wishes the U.S. military would have made a weapon that would have killed her children right away, instead of leaving to suffer decades later. 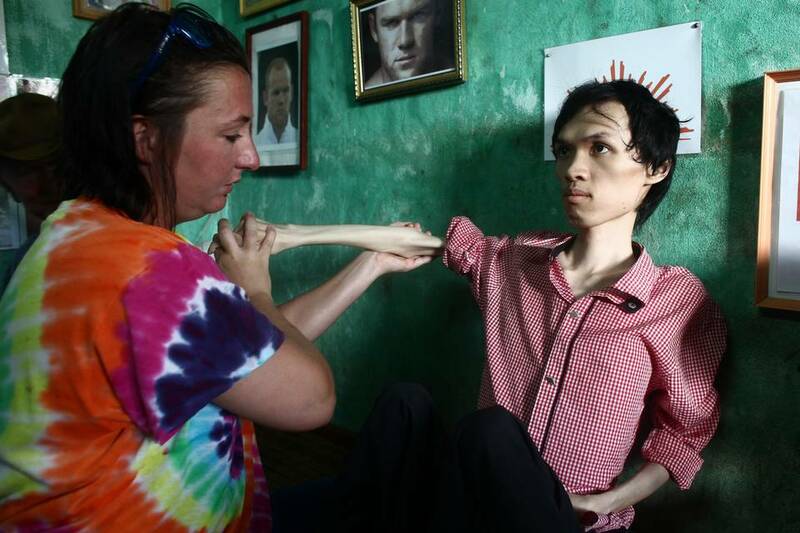 Kristen Vetter, a nurse and daughter of a U.S. war veteran, conducts physical therapy with La Thanh Toan, 21, in Da Nang, Vietnam. Toan and his brother Nghia, 18, are third generation Agent Orange victims, the result of the U.S. military's use of the herbicide more than 40 years ago. The brothers were born healthy, but began to suffer from muscular dystrophy and other problems as they grew older. Now they are confined at home as their bodies and lives waste away. The United States is paying to clean up dioxin at former American bases but has yet to offer significant aid for victims. Jan. 5, 2013. A boy hugs a girl at a center for children who have been affected by dioxin exposure in the village of Hoa Nhon, near Da Nang, Vietnam. The Da Nang Association of Victims of Agent Orange/Dioxin says that more than 1,400 children around the city suffer from mental and physical disabilities because of dioxin exposure, a legacy of the U.S. military's use of Agent Orange and other herbicides during the Vietnam War more than 40 years ago. About 60 children attend the Hoa Nhon center each day. Many have mental disabilities, while others cannot hear and speak. It usually takes a year before a new child will make friends and start interacting with others, says Phan Thanh Tien, the association's president. The Vietnam Red Cross estimates that 3 million Vietnamese suffer from illnesses related to dioxin exposure, including at least 150,000 people born with severe birth defects since the end of the war. The U.S. government is paying to clean up dioxin-contaminated soil at the Da Nang airport, which served as a major U.S. base during the conflict. But the U.S. government still denies that dioxin is to blame for widespread health problems in Vietnam and has never provided any money specifically to help the country's Agent Orange victims. May 29, 2012. Two children take a bow after performing a short dance at a center for children affected by dioxin exposure in Da Nang, Vietnam. The Da Nang Association of Victims of Agent Orange/Dioxin says that more than 1,400 children around the city suffer from mental and physical disabilities because of dioxin exposure, a legacy of the U.S. military's use of Agent Orange and other herbicides during the Vietnam War more than 40 years ago. About 200 children attend three centers operated by the group, which aims to teach the children how to read and write, sew clothes, make handicrafts and eventually integrate into society. But most of them never will because of their disabilities, says Phanh Thanh Tien, the association's president. The Vietnam Red Cross estimates that 3 million Vietnamese suffer from illnesses related to dioxin exposure, including at least 150,000 people born with severe birth defects since the end of the war. The U.S. government is paying to clean up dioxin-contaminated soil at the Da Nang airport, which served as a major U.S. base during the conflict. But the U.S. government still denies that dioxin is to blame for widespread health problems in Vietnam and has never provided any money specifically to help the country's Agent Orange victims. May 28, 2012. A boy holds a page that he has colored at a center for children who have been affected by dioxin exposure in Da Nang, Vietnam. The Da Nang Association of Victims of Agent Orange/Dioxin says that more than 1,400 children around the city suffer mental and physical disabilities because of dioxin, a legacy of the U.S. military's use of Agent Orange and other herbicides during the Vietnam War more than 40 years ago. About 200 children attend three centers operated by the group. 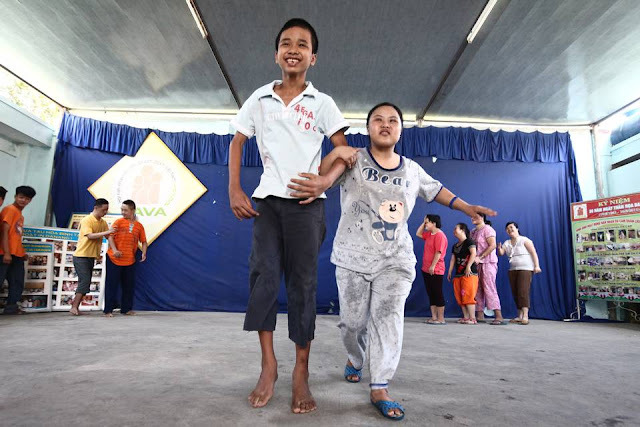 Because of their disabilities, it usually takes two to three years for the children to interact with others and to learn simple tasks, says Phan Than Tien, the association's president. The Vietnam Red Cross estimates that 3 million Vietnamese suffer from illnesses related to dioxin exposure, including at least 150,000 people born with severe birth defects since the end of the war. The U.S. government is paying to clean up dioxin-contaminated soil at the Da Nang airport, which served as a major U.S. base during the conflict. But the U.S. government still denies that dioxin is to blame for widespread health problems in Vietnam and has never provided any money specifically to help the country's Agent Orange victims. May 28, 2012. 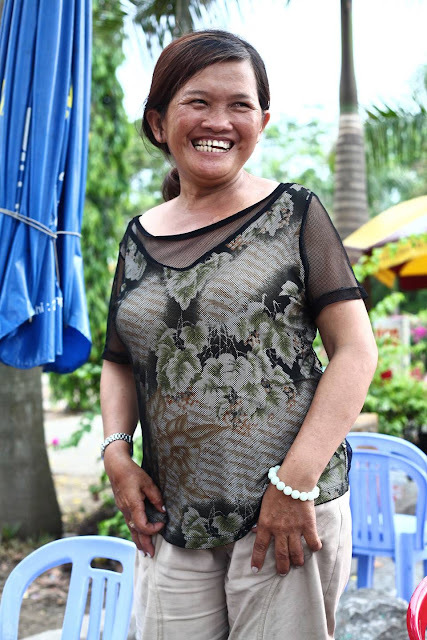 Nguyen Thi Dung, 45, grins for a photograph near her drink stand in Da Nang, Vietnam. Dung's father was a soldier for the South Vietnamese army during the Vietnam War and died at 62 from complications related to Agent Orange exposure. She and an older brother were born with hip dysplasia that doctors say is linked to their father's exposure, and she suffers from neurological damage that causes one side of her mouth to droop and for her eyes and mouth to twitch uncontrollably. "My son's condition is even worse," she says. "There are three generations in my family like this, and the doctors say that for all three generations, our condition is because of Agent Orange." The family survives partially on about $25 that each gets monthly from the Da Nang Association of Victims of Agent Orange/Dioxin, an aid group. The Vietnam Red Cross estimates that 3 million Vietnamese suffer from illnesses related to dioxin exposure, including at least 150,000 people born with severe birth defects since the end of the war. The U.S. government is paying to clean up dioxin-contaminated soil at the Da Nang airport, which served as a major U.S. base during the conflict. But the U.S. government still denies that dioxin is to blame for widespread health problems in Vietnam and has never provided any money specifically to help the country's Agent Orange victims. May 30, 2012. Mai Thi Mang, 21, a second generation victim of Agent Orange, sits with her mother and brother in their house south of Da Nang, Vietnam. Mang's father served as a bomb disposal soldier from 1975 to 1990 and worked in many areas that had been sprayed with herbicides during the war. Mang is mentally disabled because of her father's exposure, and her 19-year-old brother suffers from disorders that have left him unable to talk or even sit up on his own. Dang Chi Tam, 42, a second generation victim of Agent Orange, sits with her brother Dang Chi Trung, 43, in their home in Da Nang, Vietnam. Their parents, now deceased, were long-time members of the Communist Party, and served in the wars against the French and Americans. 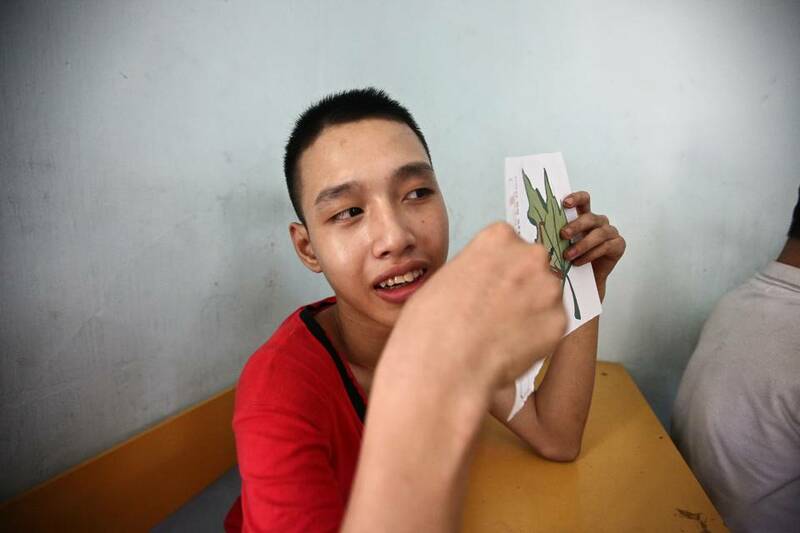 Trung is the sole caregiver for his sister, who is mentally disabled and unable to speak or care for herself. "Even personal hygiene she doesn't know how to do," he says. "Even to go to the toilet, she doesn't know how to do." They survive on about $60 a month that is provided by the Vietnamese government. "It is very difficult for us to live," he says. "Because I have to care for her, I cannot go out for very long. It is very difficult for me to get a job." 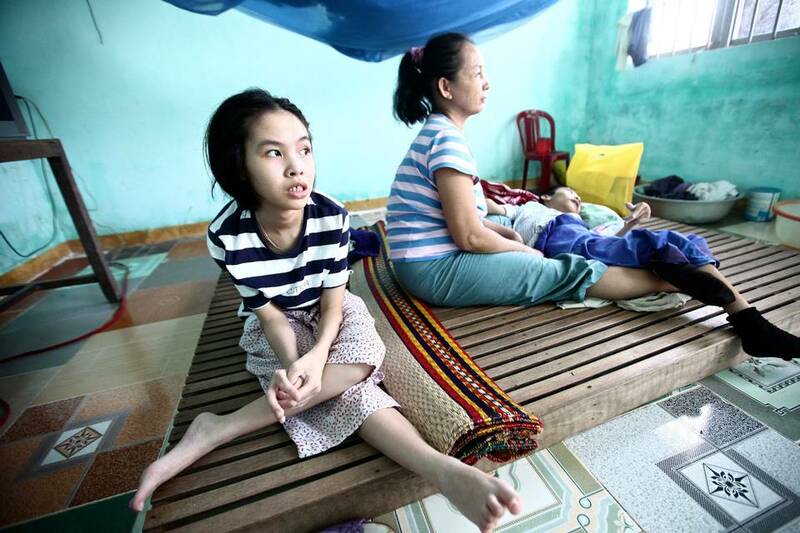 The Vietnam Red Cross estimates that 3 million Vietnamese suffer from illnesses related to dioxin exposure, including at least 150,000 people born with severe birth defects since the end of the war. The U.S. government is paying to clean up dioxin-contaminated soil at the Da Nang airport, which served as a major U.S. base during the conflict. But the U.S. government still denies that dioxin is to blame for widespread health problems in Vietnam and has never provided any money specifically to help the country's Agent Orange victims. May 29, 2012. A girl born without legs and with a malformed right arm lives on the children's ward known as the Peace Village at Tu Du Hospital in Ho Chi Minh City, Vietnam. According to doctors, about 500 of the more than 60,000 children born at the hospital each year have birth defects and deformities, many of which are believed to have been caused by dioxin left over from the U.S. military's use of Agent Orange herbicide during the Vietnam War more than 40 years ago. The United States is paying to clean up dioxin around former American bases, but has yet to offer significant aid for victims. May 1, 2013. 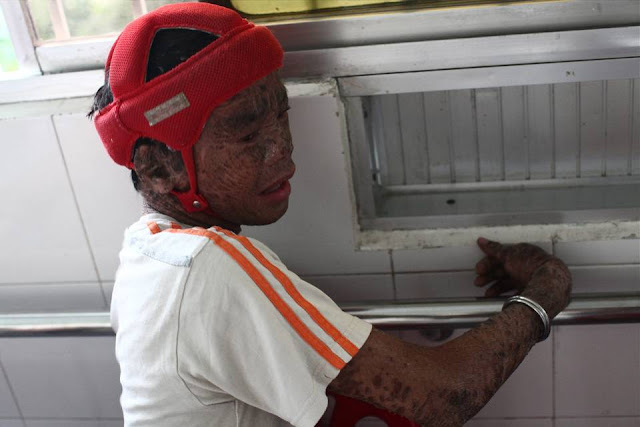 A boy with eczema so severe that he looks like a burn victim is pictured in the children's ward known as the Peace Village at Tu Du Hospital in Ho Chi Minh City, Vietnam. About 500 of the 60,000 children born each year at the maternity hospital, Vietnam's largest, are born with deformities because of Agent Orange, according to doctors. This boy is in so much pain because of his condition that he frequently bangs his head against the walls of the hospital and must wear a padded helmet so that he does not hurt himself. May 1, 2013. 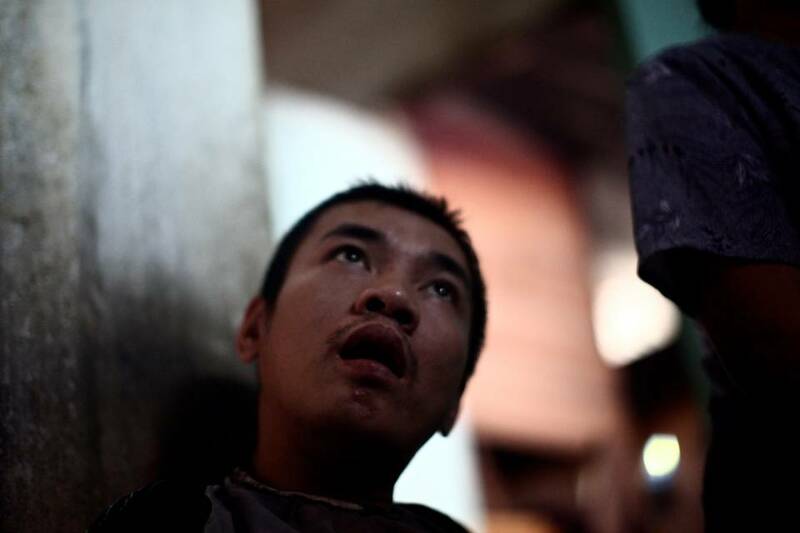 Tran Duc Nghia 39, watches as his mother talks about his condition at their home in Da Nang, Vietnam. 75-year-old Hoang Thi Te worries who will take care of her children when she is gone. She wishes the U.S. military would have made a weapon that would have killed her children right away, instead of leaving to suffer decades later. 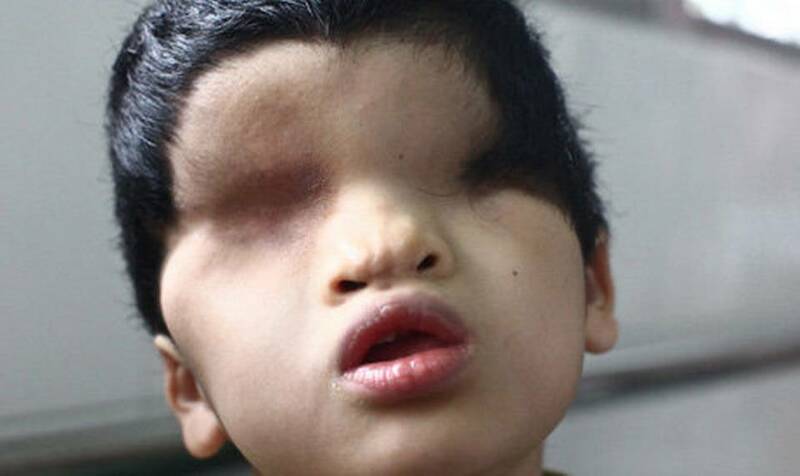 A child born without eyes, a third-generation victim of the U.S. military's use of Agent Orange during the Vietnam War more than 40 years ago . 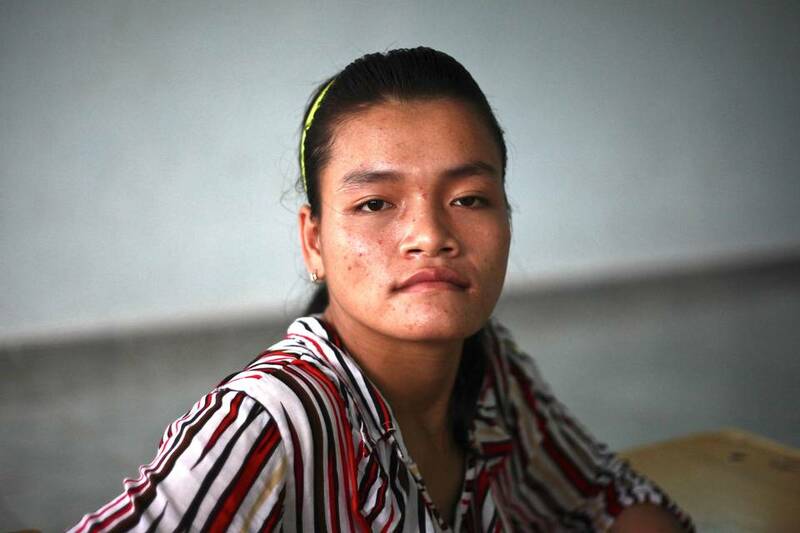 In many ways, Nguyen Thi Ly is just like any other 12-year-old girl. She has a lovely smile and is quick to laugh. She wants to be a teacher when she grows up. She enjoys skipping rope when she plays. 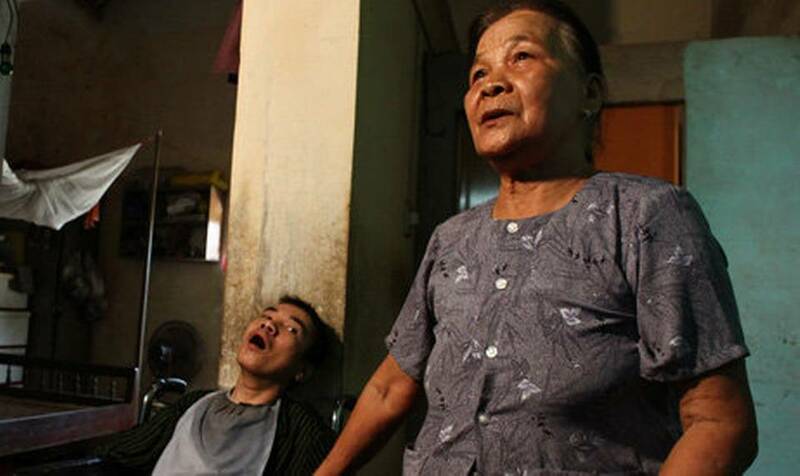 Le and her daughter are second- and third-generation victims of dioxin exposure, the result of the U.S. military’s use of Agent Orange during the Vietnam War, when the U.S. Air Force sprayed more than 20 million gallons of Agent Orange and other herbicides over parts of southern Vietnam and along the borders of neighboring Laos and Cambodia. The herbicides were contaminated with dioxin, a deadly compound that remains toxic for decades and causes birth defects, cancer and other illnesses. To this day, dioxin continues to poison the land and the people. The United States has never accepted responsibility for these victims – it denies that Agent Orange is responsible for diseases among Vietnamese that are accepted as Agent Orange-caused among American veterans – and it’s unclear when this chain of misery will end. On Thursday, President Barack Obama will meet with Vietnamese President Truong Tan Sang at the White House, only the third meeting between chief executives of the two countries since Vietnam and the United States established diplomatic relations in 1995. The two countries share many contemporary concerns. The White House says Obama plans to discuss cooperation on regional issues and trade, plus other U.S. priorities such as climate change and human rights. The two countries share a strong common interest in countering China, which has become increasingly assertive over potentially oil-rich areas of the South China Sea. Many Vietnamese say it’s time for the United States to do more to address the issue of Agent Orange and its victims, so that the last tragic chapter of the Vietnam War finally can be closed. Le Thi Thu’s father served in the North Vietnamese army and was wounded in Quang Tri province, one of the most heavily sprayed areas of the country. When her daughter Ly was born, “we knew right away” Agent Orange was to blame, Le said. The Vietnam Red Cross estimates that Agent Orange has affected 3 million people spanning three generations, including at least 150,000 children born with severe birth defects since the war ended in 1975. The most significant event to date occurred last August – 37 years after the war ended – when U.S. contractors began a project to remove dioxin from 47 acres of contaminated soil at the Da Nang International Airport, which was one of the largest U.S. bases during the war. The $84 million effort, which is expected to take until the end of 2016 to complete, has been hailed as an important milestone in U.S.-Vietnamese relations. The airport is one of the most heavily contaminated areas in the world, with dioxin levels measuring more than 365 times the acceptable limits set by the United States and other industrialized countries. Observers say that while the project represents a long overdue first step, more work needs to be done. More than two dozen other known or potential dioxin “hot spots” have been identified at former U.S. bases. Also left unresolved is the thorny issue of how best to help Vietnamese who’ve been sickened and disabled because of Agent Orange and dioxin exposure. U.S. aid for these people so far has amounted to a pittance. According to the U.S. Embassy in Hanoi, only $11 million of the $61.4 million that Congress has allocated since 2007 – a year after then-President George W. Bush pledged to help clean up contaminated areas – has been earmarked for public health programs in Vietnam. U.S. officials caution that the money is to help people with disabilities “regardless of cause,” and isn’t specifically for Agent Orange victims. This semantic sleight of hand outrages many American veterans of the war, who say the United States has a moral obligation to help Vietnamese victims of Agent Orange, just as sick and dying U.S. veterans have received government help for the last two decades. The U.S. Department of Veterans Affairs says that all 2.8 million Americans who served “boots on the ground” in Vietnam from 1962 to 1975 were exposed to Agent Orange and other herbicides, which were in use from 1961 to 1971. They qualify for compensation if they become sick from any of 15 illnesses presumed to have been caused by their exposure. The VA also recognizes another 18 birth defects in the children of female veterans. In 2011, the last year for which data was published, the VA paid nearly $18 billion in disability benefits to 1.2 million Vietnam-era veterans, including 303,000 who received compensation for diabetes mellitus, the most common of the 15 diseases associated with herbicide exposure. U.S. officials have long held, however, that there’s no proof that Agent Orange is to blame for the same diseases and birth defects in Vietnam. In many ways, the fight for recognition of Vietnam’s Agent Orange victims mirrors the 20-year struggle that U.S. veterans endured before Congress granted them compensation in 1991. Hoping to emulate a case that resulted in a 1984 settlement requiring Dow Chemical, the Monsanto Corp. and other Agent Orange manufacturers to pay $197 million in damages to sick U.S. veterans, a group of Vietnamese victims sued in 2004, only to have the same federal judge dismiss their case a year later, saying the companies were immune because they were following government orders. The Supreme Court declined to hear the case in 2009. As occurred with U.S. veterans, momentum in Congress appears to be shifting favorably toward the Vietnamese. In 2011, lawmakers directed the U.S. Agency for International Development to develop a plan for assisting Vietnam with Agent Orange programs in the coming years. The agency hasn’t yet released its proposals. For its part, Vietnam has put into motion a set of steps that it says will “fundamentally solve” its problems with Agent Orange by 2020. The document, signed in June 2012 by Prime Minister Nguyen Tan Dung, outlines preferential treatment for all ailing veterans who fought against the Americans, monthly stipends and health coverage for families with disabled members and special care for pregnant women from contaminated areas. The Aspen Institute, a Washington-based research center, has called on the United States to spend $450 million over 10 years to clean up Vietnam’s dioxin hot spots, restored damaged ecosystems and expand health care for people with disabilities. It’s unclear how much Congress is willing to do. Rep. Barbara Lee, D-Calif., introduced a bill last month that would commit the United States to cleaning up all remaining sites and would provide assistance to help Vietnam give better health care and other resources to Agent Orange victims. An identical bill introduced two years ago failed to make it out of committee. Searcy, the former intelligence analyst who lives in Hanoi, points out that after nearly 40 years, Vietnam’s expectations of the United States remain modest. “I think it’s possible to bring some closure to this within the next decade,” he added.